At Insight English, we run a 4-week in-class TEFL course in Thailand at our modern and well equipped training centre in Cha-Am, which is about three hours south of Bangkok. The course lasts for four weeks and is taught by our qualified and highly experienced trainers. Cha-Am is a beautiful coastal town with gorgeous tropical white sand beaches and a rich culture. The town is a popular holiday destination for Thai people from Bangkok and is well known for spicy fresh seafood dishes that are sold at the town’s bustling markets. The town is a 20-minute drive from Hua Hin, which has exciting nightlife, modern shopping malls and the palace of the longest reigning monarch in the world! We guarantee a job placement in Thailand/Asia upon successful completion of the course. The TEFL course includes 20 hours of observation and practical teaching experience in a Thai classroom, which will ensure that you are well prepared when you start your first job as a foreign language teacher. The course also includes a cultural element so you will have a better understanding of Thai culture, politics and etiquette. There are also basic Thai language classes. Transfer from Bangkok Airport to Cha-am. Accommodation in Cha-Am for the length of the course. TEFL course book and bag. Thai cultural instruction and experience. Teaching observation and teaching practice in a Thai school. 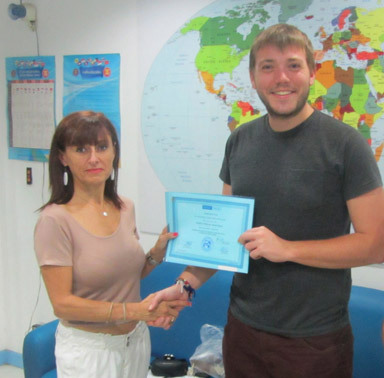 TEFL certificate recognized internationally and licensed by the Thai Ministry of Education. Advice and assistance regarding visas and work permits. Our TEFL trainer, Andre Greyling has over 25 years teaching experience at primary, high school and university levels. Andre worked for four years as an educational advisor and a further six years as a practicing psychologist. Andre holds a Higher Diploma in Education, BA in Languages and Psychology, BEd in Educational Psychology, a Masters Degree in Educational Psychology and a TESOL qualification.